Lows: Getting bug bites; getting ripped off with purchases I made; overnight trains. 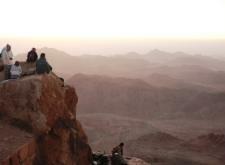 Best Moment: So far it was spending time in Dahab (I was getting quite used to being a Dahabian). Smells: Sea; our dinner being cooked on the felucca. Sounds: Waves of the water; horns honking; Egyptian music; prayer calls. many different flavors and is quite tasty). paintings done on papyrus; wooden boxes. Street Food: Fuul; falafel; breads in different shapes; fruit juice. Type of currency? Egyptian Pound (EP). One U.S. dollar is ~5.75 EP. Transportation: From Dahab to Cairo: a minibus (7 hours) for 100 EP. Waiting for the sunrise at Mt. Sinai. 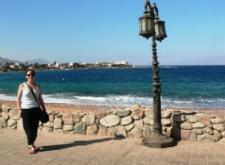 Along the coast of Dahab. 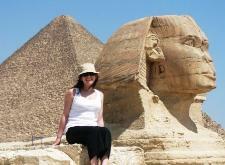 The Sphinx and Great Pyramid at Giza.